Hong Kong is known as the "World&apos;s Food Fair", and dining out is one of the most popular things to do as a tourist. From roadside stalls to world-class restaurants, Hong Kong offers a wide variety of choices when it comes to food. Here are 20 popular local foods to try. 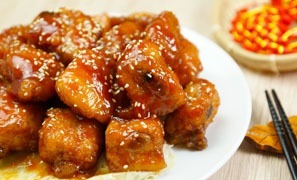 Sweet and sour pork is probably the most famous Hong Kong food, which has made its way into Chinese take away menus around the world. We have a page on How to Cook Sweet and Sour Pork, and even a video, so rather than describe the well-known pork ribs or tenderloin in the delicious orange sauce, click to see and read how its made in detail. The taste texture is very smooth and quite oily. A more Hong Kong style version would be cooked without peppers, and instead pieces of salted fish. 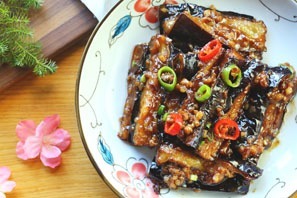 It&apos;s extremely popular and much ordered in restaurants or dai pai dong (traditional licensed food stalls) together with rice. For making authentic Guangdong-style Roast Goose you need a special goose variety from that region. These geese can be raised in a short time and have a lot of meat and small bones. Eating it has become a tourist attraction in itself in the New Territories. 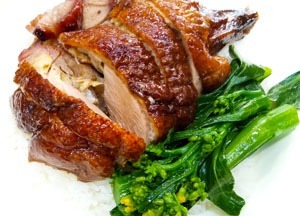 Yung Kee, situated in Central, with a history of over several decades, is famous for Roast Goose. Yue Kee, with over 40 years history, is the most notable restaurant in Hong Kong serving this delicacy. The former U.S. Consul General in Hong Kong was a regular customer. 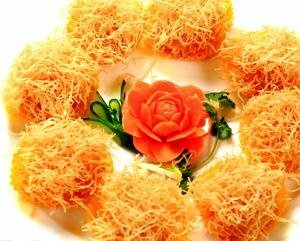 Its Chinese name is &apos;dragon and phoenix balls&apos;. Dragon refers to the shrimps, and phoenix refers to the chicken. The name is related to Chinese royalty: the emperor (dragon) and the queen (phoenix), and is usually served in Chinese wedding ceremonies. Though foreigners might feel a bit apprehensive when hearing its name, Chinese people, especially the older generation, are fond of phoenix talons. It’s important to cut off all the nails of the chicken feet before frying them. The fried chicken feet are placed on a small plate, and placed into a bamboo steamer. 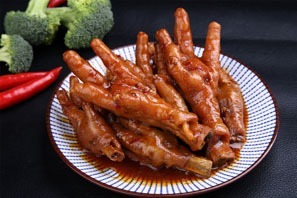 After frying and steaming, chicken feet become very soft and you can easily chew the bones. Phoenix talons can be served individually as well as with pork ribs and rice. 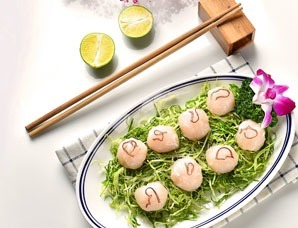 According to a statistic in 2002, the daily average consumption of fish balls in Hong Kong is 55 metric tons (about 3.75 million fish balls). Hong Kong-style milk tea is a popular part of many Hong Kong people&apos;s daily life, typically served as part of afternoon tea. Hong Kong-style milk tea consists of Ceylon black tea, evaporated milk and sugar, the tea at the bottom and evaporated milk on top. Hong Kongers like to say that in a cup of superior milk tea the taste of milk should be stronger than the tea. Different ingredients and cooking methods produce various flavors. 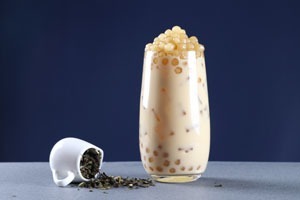 By and large, milk tea is standard fare in Hong Kong-style Western restaurants and Cha Chaan Teng, as well as Hong Kong&apos;s historic Dai Pai Dong (a Hong Kong-style outside restaurant). Nowadays, Hong Kong-style milk tea has become a symbol of Hong Kong culture. In Hong Kong films actors frequently mention it in dialogues. Lan Fong Yuen (a Hong Kong-style Cha Chaan Teng), situated in Central, is famous for its original Hong Kong-style milk tea and has a history of over 50 years.Continue to read about Chinese tea. The surface of the bread looks a pineapple, hence the name, but the traditional variety doesn&apos;t actually contain pineapple. 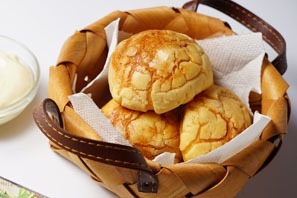 A mixture of sugar, eggs, flour, and lard form a crisp surface with soft bread underneath, and it&apos;s best eaten when hot. 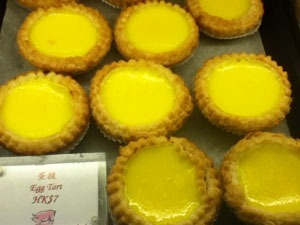 The egg tart is a popular pastry in Hong Kong. Hong-Kong-style egg tarts are made of butter and flour with a sweetened egg filling. First introduced to China via Macau’s Portugese colonizers, only since the 1940s have egg tarts flourished in Hong Kong tea restaurants. They are frequently eaten with afternoon tea. Now you can find egg tarts in most HK bakeries, café’s, and tea restaurants. Egg tarts from the Taichang Bakery are most popular with locals and visitors. 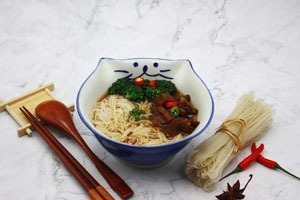 Beef brisket noodles, known as ngau lam mein or niunanmian in Mandarin (牛腩面), is a typical Hong Kong dish. As its name suggests, the main ingredient is beef brisket (belly beef), which is braised or stewed and served on top of wheat noodles. There are a lot of restaurants in Hong Kong serving this dish, and Kau Kee (九記牛腩) is the most famous one. If you have never eaten snake before, you should have a try in Hong Kong. Snake soup is a popular delicacy in Hong Kong due to its (reputed) medicinal benefits and high nutritional value. The history of this dish can be traced back to 2,000 years ago. Feeling dubious? No need to worry, as you won’t see anything resembling a snake, and it tastes like chicken and mushroom soup. She Wong Lam (‘Snake King Lam’) in Sheung Wan is a recommended restaurant for snake soup. 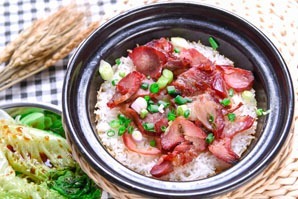 Steamed rice in a clay pot or clay pot rice (煲仔飯) is a traditional Cantonese dish. It looks like a simple creation with white rice and a choice of toppings cooked on a traditional charcoal fire in a clay pot. However, the combination of slightly smoky steamed rice, carved pork, smoked sausage, chicken, or beef, with fresh shallots and a special sauce has long been a winning one. Hong-Kong-style custard, also known as steamed milk pudding, is a milk-based dessert. 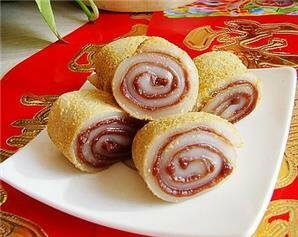 It is regarded as a healthy dessert enjoyed particularly by women, elders, and kids in Hong Kong and Macau. The texture of the custard is soft and smooth (it’s even smoother than a soy milk or egg pudding). It can be served hot or chilled, and covered with red beans, lotus seeds, or fruits. Yee Shun Milk Company (義順牛奶公司) is one of the classic dessert places in Hong Kong, where you can eat Hong-Kong-style custard. 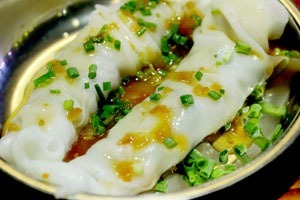 Steamed rice rolls or rice noodle rolls (cheong fun 腸粉) are classic dim sum in Hong Kong. 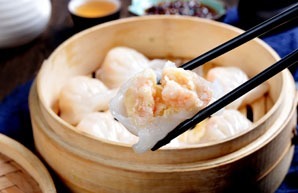 They are made of steamed rice sheets, rolled and filled with beef, shrimp, or char siu (barbequed pork) with vegetables and sauces. Rice rolls are made on the spot and you can order them according to your palate. 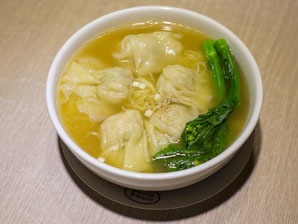 A Michelin restaurant called Tim Ho Wan (添好運) is a one of the best places to try this food. In the past, a lot of hawkers used shark meat leftovers from restaurants as principle material of this snack. Nowadays, shark fin has been replaced by vermicelli as the main ingredient of this snack, hence the ‘Fake&apos; added in front of the name. Fake shark fin soup was widespread at Mosque Street in the 1980s. As one of the street snacks, Fake Shark Fin Soup used to be served in small bowls and sold by vendors along the streets; hence it obtained another name “Shark&apos;s Fin in Bowls". Lvzaiji Restaurant, A121 Shau Kei Wan Main East Street. 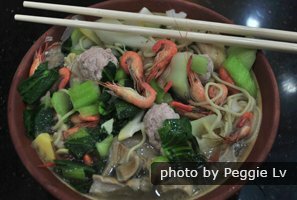 The so-called Rickshaw Noodles are a kind of fast food, really good value for money, and popular with the Hong Kong people since the 1960&apos;s.
At least 98% of the residents in Hong Kong are Chinese, either Cantonese, Teochew, Hakka, or Shanghainese. Many enjoy a traditional breakfast that includes congee (rice porridge) and yau cha kwai (oil fried bread sticks). However, Western breakfasts that include bread, sausage, pancakes, and eggs are becoming more popular. For mid-day and evening meals, most people serve Chinese food with rice in their homes. 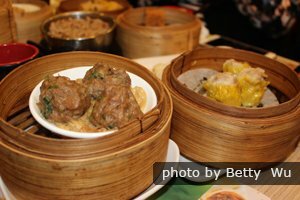 Some of the most common ingredients used in Cantonese cuisines include shiitake mushrooms, Chinese cabbage, salted duck eggs, kai-lan, red beans, dried shrimp, hoisin sauce, dried scallops, jujube, and lotus seeds. 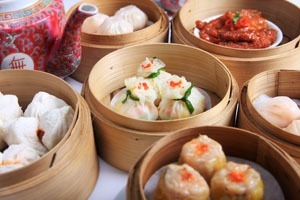 Of course, dim sum (rich snacks that you can make meals of, customarily served with tea) is very popular too. Many of the restaurants in Hong Kong have been influenced by both Eastern and Western cultures. 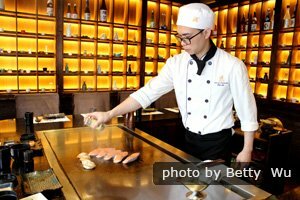 In just this one city, food enthusiasts can indulge in all kinds of authentic cuisines from Japan, Korea, Thailand, Malaysia, Singapore, Vietnam, India, Europe, and America. With such a wide variety of food, Hong Kong has truly become a gourmet eating paradise. Want more help? Our expert travel advisors can help arrange your itinerary to make sure you catch all the best eateries while you explore the city. Request a tailor-made itinerary — response within 24 hours. 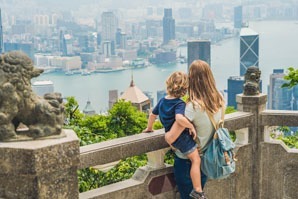 The following will give you the chance to see some of Hong Kongs highlights and taste soem HK food. 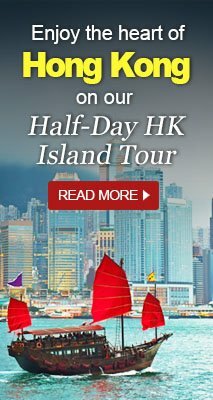 Or you can see more of our other recommended itineraries Hong Kong tours.